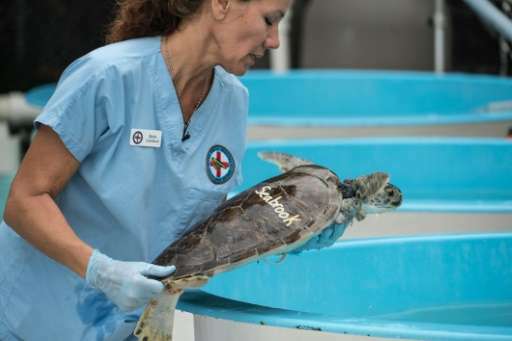 This endangered green sea turtle, about two years old and too young for the staff to know yet whether it is male or female, is infected with fibropapillomatosis, a potentially deadly disease caused by a type of herpes virus. Experts still don't understand quite how the virus spreads, or what causes it, though some research has pointed to agricultural runoff, pollution and global warming. 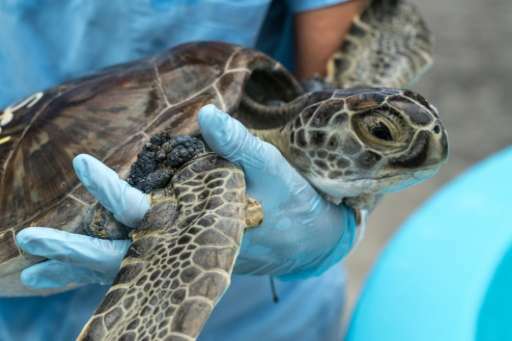 As the population of green sea turtles rebounds in and around the Florida Keys, cases of fibropapillomatosis have exploded too, filling the corridors of the United States' oldest rescue and rehab facility, known simply as the Turtle Hospital. "When I first started here 20 years ago, I would do six to eight of these a month," says veterinarian Doug Mader, as he injects a local anesthetic, then cuts off the cauliflower-like growths with a carbon dioxide laser. "Now we are doing six to eight a week," he says as the air fills with the smell of saltwater, alcohol wipes and burning flesh. Each turtle can require several operations to remove all the tumors, which cover their necks, underbellies, and eyes, blinding them and making it hard for them to find food. Green sea turtles were first listed as endangered species in 1976, but are now nesting in record numbers—28,000 nests counted last year in Florida, up from fewer than 500 decades ago. Their status may be changed from "endangered" to merely "threatened" as early as March. While conservationists celebrate these successes, they also lament that the animals' environment is increasingly polluted and hot, as the oceans absorb most of the warmth from human-driven climate change. The evidence lays before Mader every day in the clinic. "I have this horrible feeling that as the oceans warm we are going to see more and more disease," he says. Nestled in a bright green motel complex connected by pebble strewn pathways, the Turtle Hospital opened its doors in 1986, taking in 12 patients in its inaugural year. Last year, it treated 173 sea turtles—119 of them with fibropapillomatosis—according to manager Bette Zirkelbach. These days, the hospital has never been busier. Its staff of 18 and fleet of orange-and-white ambulances can be dispatched around the clock to fetch injured turtles. Fibropapillomatosis was first documented in sea turtles in the 1930s, and is pervasive in warm waters around the world. Zirkelbach says about half the green sea turtles in the area are infected, and the cases are getting worse. "In 2012 it was rare to have a turtle coming in with tumors on both eyes. By fall of 2013 almost every turtle that came in with this virus had both eyes covered with tumors." After spending a year in the hospital's pools, tumor-free, the turtles may be released. But if the lesions get into the kidneys and lungs, there is no way to save them. These days, just one in five green sea turtles with fibropapillomatosis will make it back out to the wild, says Zirkelbach. "They are just too sick." On a typical Tuesday in January, Mader sees patient after patient, most of them rescued after boat strikes, swallowed hooks, entanglements with fishing gear, and disease. It's a spectacle that tourists pay to see. A visit to the Turtle Hospital costs as much as an afternoon at the movie theatre, but offers a glimpse of real veterinary teams as they operate on sick turtles behind a plate glass window. And while the US Fish and Wildlife Service Conservation Commission issues the hospital's permit and is supportive of the work they do, visitor cash is what pays for all the services, according to owner Richie Moretti. He says 75,000 people visited last year alone, fully funding a hospital which currently hosts more than 60 turtles and costs about $1.5 million a year to operate. Some tumors are mysterious, like the one Mader sees on a female 80-pound (36 kilogram) adult Kemp's Ridley, who has a bulbous growth the size of an avocado seed near her back right flipper. She is not an eager patient. A young male attendant leans over the operating table, presses his belly against her shell and hugs her still. "Sshhh," he whispers, as he waits for the anesthetic to kick in. Moments later, the reptile relaxes. Mader cuts off the tumor with a radio scalpel, then expertly stitches her back up. 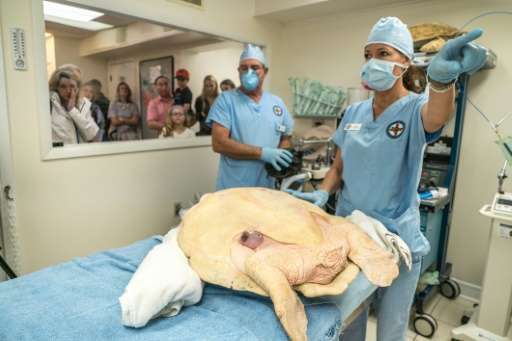 Next, the biggest patient of the day—a 190-pound (87-kilogram) male loggerhead turtle that may be as old as 70, has been hit by a boat and hasn't been eating. He shows symptoms of lockjaw, perhaps from a fishing hook stuck in his hard palate and visible on an X-ray. The team works for 45 minutes, reaching in the turtle's mouth to extract the hook, but it's been pushed too deeply into the soft tissue near the back of the throat. "Someday, I hope all fishing gear is biodegradable," sighs Mader. Eventually, he decides the hook will have to stay where it is. The staff will try physical therapy for the turtle's jaw, and try to get him to eat again before releasing him. "It's frustrating," Mader says, as the attendants roll the turtle out of the operating room. "You want to fix every one of them."